Ontario Soccer is pleased to announce the addition of Carmelina Moscato to the 2019 lineup of the Ontario Soccer Summit. Moscato, the Olympic bronze medalist and former Women’s National team player, will lead an on-field tactical session and will join the Keeping Girls in Sport Panel at the Ontario Soccer Summit, March 1-3, 2019 in London, ON. 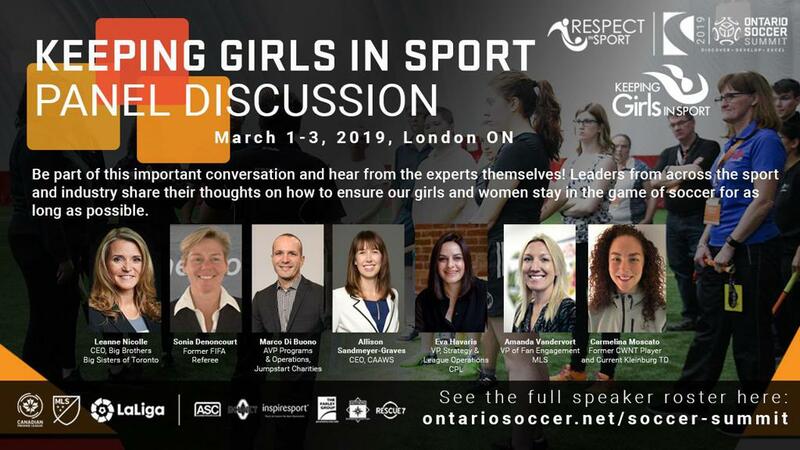 Also, on the panel will be Leanne Nicolle (CEO and President, Big Brothers and Big Sisters of Toronto and member of Canada Soccer Board of Directors), Sonia Denoncourt (Former FIFA Referee), Marco Di Buono (Assistant Vice-President of Programs and Operations, Canadian Tire Jumpstart Charities), Allison Sandmeyer-Graves (CEO, Canadian Association for the Advancement of Women and Sport and Physical Activity), Eva Havaris (Vice-President of Strategy and League Operations, Canadian Premier League) and Amanda Vandervort (Vice-President of Fan Engagement, MLS), as they have a conversation on how to ensure girls and women stay in the game of soccer for as long as possible. Moscato also joins a line-up of speakers from across the world, including keynote speakers John Herdman (Canadian Men’s National team), Howard Webb (GM of PRO) and Nancy Spotton (CEO of MPWR). Tickets continue to sell at a record pace for this year’s membership team-building event and an Ontario Soccer Summit sell-out appears imminent. With the second window of pricing closing on Feb. 7, which offers the best dollar value anywhere in soccer development, be sure to act quickly so you don’t miss out. Visit OntarioSoccer.net/SummitTickets to register and purchase yours. The Ontario Soccer Summit preferred hotel blocks have been extended until Feb. 8.